The San Francisco General Hospital Parking Garage accommodates 820-plus parking stalls, with a planned 400 parking stall expansion. The design breaks down the mass of the garage and relates to the surrounding neighborhoods of large institutional buildings, small scale commercial developments, and Victorian-era residences. A 28-foot structural bay module is set to integrate with the module widths of adjacent residential lots. The fluted architectural pre-cast columns emphasize each bay with a level of refined detail. The trademark pattern at the structure's parapet takes inspiration from the articulated cornices of its Victorian neighbors. 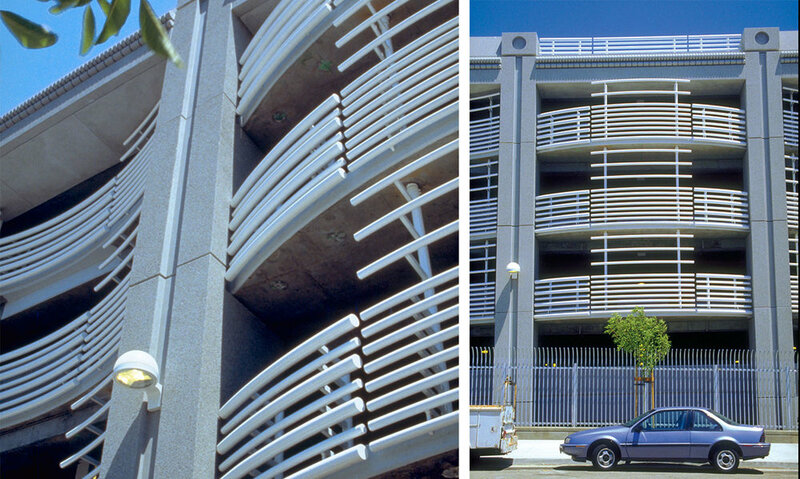 Undulating guardrails provide a light and airy visual screen that softens the street facade. These curvilinear railings were designed to imitate the grill of an old automobile. The curvaceous circulation towers echo a local residential design feature and extend diagonal views beyond the site. The corner stairwell areas assure greater visibility and organizational clarity, ensuring user safety.